This post has been a long time coming… like almost a year in the making. Though admittedly we don’t feel 100% done done done with this room like we do with our newly updated kitchen, we vowed to give you more glimpses into the “in-progress” or “mostly-finished” projects around our home this year as a way to bring you along on the journey more often, so consider this our first step in making good on that promise! The project at hand? Our master bedroom makeover, which we first introduced you to all the way back in May (where you can also see more “before” pics of the space). The reality is that it can take a long time for us to completely finish updating a room and get it to a place where we feel 100% done with all of the projects and pieces involved. It definitely doesn’t happen overnight and even though we live in this crazy world of blogging where it can sometimes look like these projects happen in a matter of days, that’s just not usually how it goes. And there are a few reasons behind that. The first is that we DIY a lot of things along the way, and DIY projects take time and care. The second is that we love finding all of the second hand, antique, loved-and-left-behind items we can to mix into any room in our home, and finding the right thing second-hand can also take a lot of time… and scrolling… and wishing… and waiting. The third is that we take our time choosing things that we hope will be permanent fixtures in that room, including decor pieces big and small because we want it all to last. As you know we’re not into clutter and stuff stuff stuff, so we like to be intentional with our choices. It can take months for us to hunt down a rug, a piece of art, a duvet, a fan, a blanket, etc. etc. that we love, and we really do want to love the things we’re bringing into our home and living with every day. 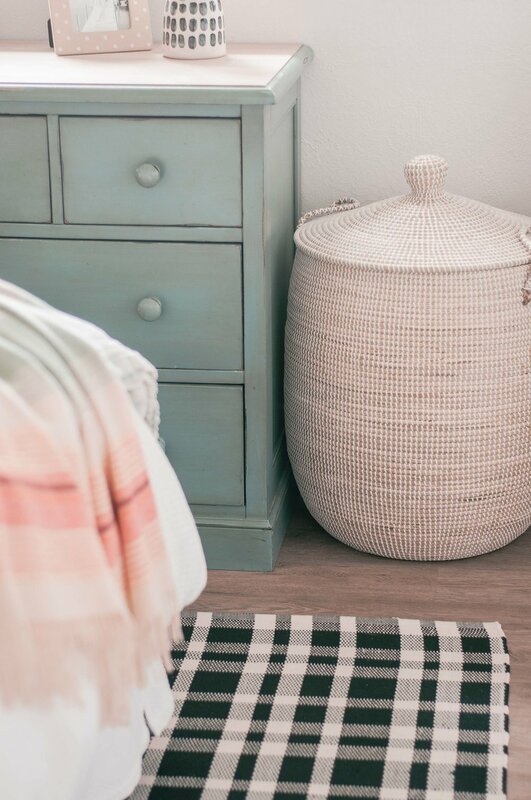 As you can tell from the inspiration and “before” post for this project, we really wanted to create a mostly neutral, super cozy, cottage-farmhouse-esque space that would make our small master bedroom feel like an inviting oasis that we never wanted to leave. That’s how a bedroom should feel, in our humble opinion! Like the most fluffy, comfy-cozy den that fosters deep sleep and morning lingering. Of course, it’s always hard for me to go completely neutral with a space and forgo any sort of color altogether, especially my beloved seafoam, so as you can see that made its way into this room a little bit in the end, but it always makes it easier for me to add a little touch of color in the bedroom when I start with all-white bedding… which is definitely the most impractical lifestyle choice ever if, like us, you have a pup that sleeps in the bed and always has dirty paws and a pumpkin-filled beard. Hey, sometimes you have to sacrifice the practical for something you just plain love, right?! Right. 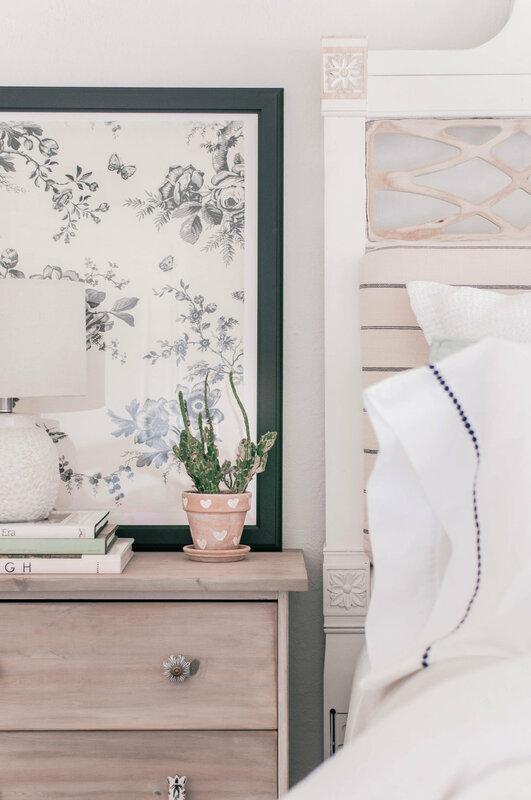 We force ourselves to choose the practical option a lot around this little house of ours, so I consider white bedding one of my impractical wins and love every second of it. The other mix I just absolutely love in any room is a fun and funky mix of pattern, texture and styles that breaks the rules a little bit. Like the ruffled toile quilt paired with the striped, woven tan and white blanket, paired with the seafoam quilted shams, paired with the white honeycomb duvet, paired with the black and white plaid rug, paired with the black and white toile fabric art, paired with the white pillowcases with black dots, paired with the woven seagrass tray on the dresser, paired with the funky painted dot and etched bubble vases. Mixin’ it up and keepin’ it spicy! Obviously overall this room is pretty cottage-farmhouse-esque like the rest of our home, but I love throwing in some Southwestern style to give our home a sense of place, complete with my trusty cowboy boots that have been hanging around for the better part of 15 years and this mint, Southwestern style wool throw pillow that I switch in and out with the white fringed one you see here. One of the things I’ve learned about you guys over time here on the blog is that when it comes to room makeovers and just home design and decor content in general, you like two things: Clear, detailed, step-by-step breakdowns of any DIY projects included in the post and a breakdown of sources for each and every decor item seen in the pics, including a plethora of similar options for antique/second-hand finds or out-of-stock items. And it’s in that spirit that I wanted to make sure to be super thorough when it comes to the sources for this room, so below is a breakdown of all of the things that are antiques/second-hand finds or out of stock with similar options included wherever possible, as well as every item that’s in stock that you can shop right now. Boom! I hope our tiny master bedroom space inspires you guys to get in there and build the bedroom of your dreams, no matter what your budget! As you can see from the previous posts about this room and all of the source links, everything in this room is relatively affordable, which is exactly how we like it! This room was built on cheap and easy DIY projects that make a big impact, lots of old items that we’ve breathed new life into, inexpensive, interesting and charming antiques, and stylish, budget-friendly decor items that look just like their higher-priced counterparts. Like I mentioned, we’re still searching for the perfect fan/light combo that isn’t an eye sore, but will keep us cool in those steamy summer months and a headboard that we can fall in love with, so send any recommendations my way if you see something you think we need to know about. Sharing is caring and we’ll take all the help we can get!